Taras Palace at Powerscourt House in Wicklow, is one of the greatest dolls houses in the world, on par with the Fairy Castle in Chicago, and Queen Marys own dolls house at Windsor Castle in London. Taras Palace is modeled on the famous Titania’s Palace which was sadly lost to Ireland in the 1970s and is now on display at Egeskov Castle in Denmark. The original having been built in Dublin in the early 1900s for Sir Neville Wilkinson’s daughter Gwendolen, who like all other little girls believed in fairies. 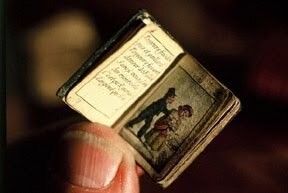 A wealthy man, he commissioned artists and craftsmen from all over the world to recreate this view of their privileged world in precise and meticulous miniature. With 18 rooms and over 3000 individual pieces it took some 18 years to complete and such a triumph that it went on public display for childrens’ charities, a role Tara’s Palace continues today. The 9' wide façade is a combination of famous Irish Houses notably Leinster, Carton and Castletown, with many of those unique interiors such as the Print Room in Castletown having been recreated to a scale of one twelfth of their original size. Yet, like all dolls houses Taras Palace is primarily a toy, designed to ignite the imagination of children of all ages. From 'The Story of the Present' by Miss Amanda Stafford. Such is the level of craftsmanship that is extremely easy to imagine this fabulous dolls house coming to life. It’s all in the detail, the keys actually fit and turn in each of the tiny locks, and every visitor is sure to have their own favourite? Whether it’s the grand reception rooms, kitchen with its tray set for afternoon tea, toys in the nursery or the music room with its exquisite tiny golden violin. From the library with it collection of readable first editions to the ornate plaster ceilings and inlaid parquay floors with persian rugs it’s fascinating and one of those rare exhibits that you could visit over and over again and still find something new to marvel at....especially as generous benefactors are constantly adding to the collection.